We are a leading manufacturer of roller shells, able to supply roller shells to fit all brands of pellet mill machines. We deliver to customers around the world. With over 30 years experience in manufacturing pelleting machinery, we have the knowledge and experience to advise and provide solutions for our customers, supplying them with the highest quality parts customised to their unique requirements. We can manufacture roller shells according to customer's technical drawings, or for popular models of pellet mill according to our specification sheet here. With hands-on experience in the industry, we understand the time-sensitive nature of spare parts, and manufacture our roller shells in rapid time to minimise customer's downtime. Corrugated Roller Shells - Straight & helical with either open or closed ends. The most popular type of roller shell used for pelleting industry. Corrugated roller shells are popular as they reduce slippage of materials and offer resistance to plugging the die. While this type of roller shell will see better compression of processed formulation, wear of the die is not as even as with dimples roller shells. These roller shells are drilled with holes 'dimples', which when filled with the pelleting material create more friction on the surface and give better traction. Also known as honeycomb or perforated roller shells, dimpled roller shells have less drag and compression than corrugated roller shells, but have a longer working life and result in more even wear on the pellet dies. Tungsten particles are applied to the exterior of the roller shells to provide better traction, greater durability and a longer working life. We supply complete units of of roller shell aseemblies for popular pellet mill models. Manufactured with extreme precision using the highest quality steel, ensures our roller shells are provide high resistance to abrasion, breakage and corrosion. Our roller shells are manufactured from high carbon steels. Normally in the following specifications: C50, 100Cr6 or 20MnCr5, we can also produce roller shells to our customer's material specifications. All roller shells are surface hardened, ensuring our roller shells have maximum durability and a long working life. All our work is carried out in-house, allowing us greater control over the manufacturing quality control. Our roller shells are extensively monitored throughout every step in the manufacturing process, with all our roller shells being inspected and run before delivery. 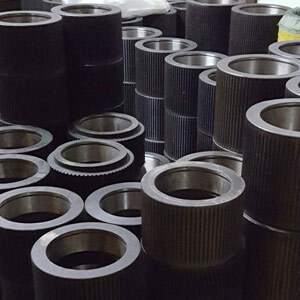 Our factory is also able to repair and refurbish used roller shells, helping customers to take advantage of all productive capacity in the roller shell until the very end of it's useful life. This can save the customer alot in the running of their pellet mills. We also rebuild roller shell assemblies using genuine components and high-grade bearings, with a quick turnaround time. We sell used roller shells that we have reconditioned ourselves in our factory.